Bird droppings are no fun, for anyone. Word Droppings by Duong Nguyen, on the other hand, is fun for everyone! Get your brains ready, because this game app is a bit like Scrabble mixed with a word search on caffeine, so you won’t have time to pull out any dictionaries–instead, you’ll have to survive solely on your wits and the speed of your finger. All you really have to do is make words. Letters will fall down from the top of the screen: tap on them one-by-one to create a word, then tap Enter on the lower right corner to submit it. The Delete button is right across the screen on the left, or you can tap inside the word you’ve created to move the cursor (or drag it). The more letters you use, the more points you’ll receive, so you’ll want to be as nerdy as possible with your words. 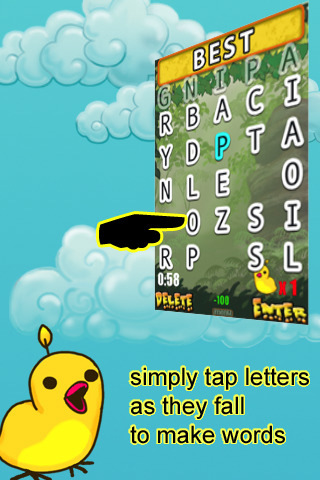 To speed up the flow of the letters, just tilt the device, but the speed does increase with each subsequent level. A level ends when the timer runs out, or when you lose all your lives. There are other sorts of objects floating down, such as worms and bombs…guess which one’s the one you want! Tap on the worms to get a little bonus and make a word before the bomb reaches the bottom, or else you’ll lose one of your lives. There are over 75 levels to play through, but one of the most exciting aspects of Word Droppings is that you can play other people online (from friends to total strangers) if you have an internet connection. For such a gross conceptual beginning, Word Droppings is a really cutesy thing, with its bright colors and absolutely adorable birdies and happy sounds. The gameplay is a tad rough around the edges, and the trappings are completely unsophisticated, but it is honestly fun AND educational (you’ll be saddened to see how many of your words are shorter than four letters). It’s probably better suited for younger children, yet older kids and adults should have no problem picking this game up and whipping their vocabularies into some sort of shape. For only $1.99, you can have a little fun while exercising your gray matter (there is a free version for you to try, if you’re still undecided). iPad version: Word Droppings HD ($1.99) is the iPad version of the same app and is also highly addictive and fun to play on your iPad. AppSafari review of Word Droppings was written by Julie Guan on May 20th, 2010 and categorized under App Store, Education, Fun, Games, Multiplayer, Puzzler, Strategy. Page viewed 3002 times, 2 so far today. Need help on using these apps? Please read the Help Page.